if it so be that ye shall keep the commandments of the Holy One of Israel. Lehi begins to address his son Joseph. His beginning remarks are similar to his beginning remarks to Jacob: he speaks of their birth during his time of affliction (their desert travels with rebellious sons Laman and Lemuel), and he assures Joseph of security and Jacob of safety. He reiterates on a personal level to Joseph the global covenant of the Promised Land: keep the commandments and you will inherit the land and prosper. As we keep God’s commandments we become like God, or we become holy or consecrated. He in turn gives us the promised land, and we can view it as a holy gift, or as something consecrated by God. Americans view their life in America through different lenses, according to their personal ideology. It is a land of opportunity. It is the land of the free and the home of the brave. It is a country divided by race and wealth. It is a land made rich on the backs of poor third-world countries and oppressed workers. Whether there is truth in any or all of these opinions, Lehi cuts to what is significant about America: It is a gift from God to those whom He has chosen, and He has made it holy for us, if we in turn make ourselves (and as much of our country as we can) holy for Him. may the Lord bless thee forever, for thy seed shall not utterly be destroyed. Lehi’s message to his last-born son is surprisingly different from his message to Joseph’s next older brother, companions in their wilderness birth. Both are good boys, and will grow to be righteous men. Lehi has emphasized Jacob’s personal ministry, and explained doctrinal concepts that will help him in that ministry, as well as help him understand and accept his older brothers’ rebellion against God. Lehi’s message to Joseph includes no hint of Joseph’s personal future life. He is assured that he will be blessed, but the blessing consists of the rather stark statement that not all of his seed will be destroyed. This whole chapter will be a message of familial salvation and faithfulness, a thread of righteousness running through history. Lehi’s statement that Joseph’s seed will not all be destroyed implies that there will also be many of the family who choose to turn away from believing and walking in the truth. At the end of his life, Lehi accepts what he only dreaded when his saga began. The wickedness of his people at Jerusalem and their imminent destruction were so obvious to him, he could not imagine that his own sons would choose to go down that path. But now he knows. He knows that in every generation there is personal, spiritual destruction, and when the society has preponderantly darkened and is ripened in iniquity, God will bring forth a new people. Periodic destructions are certain. Therefore, if a righteous person receives that promise that his seed will not be utterly destroyed, it is indeed a blessing. and I am a descendant of Joseph who was carried captive into Egypt. And great were the covenants of the Lord which he made unto Joseph. Lehi establishes a connection between his son Joseph, to whom he is speaking, and his ancestor Joseph I. We know nothing of Joseph’s experiences or feelings as he traveled through the wilderness on his way to slavery in Egypt, and we know a great deal about Lehi’s experiences and feeling as he traveled through the wilderness to his new life in the promised land. Ancestor Joseph I would never leave Egypt again, although he would be reunited with his family. The chains of his captivity would become exceedingly light, but they would be there, nonetheless. He would obtain a land for his people, but it would be a temporary arrangement, and they, too, would suffer severe afflictions in their captivity. Therefore God’s great covenants with ancestor Joseph pertained to his future family, and Joseph the son is part of that family. He need not despise the blessing that he received, assuring him that his seed would not utterly be destroyed. As we shall see, it is encompassed in the blessing which Joseph 1 received. Wherefore, Joseph truly saw our day. yea, out of hidden darkness and out of captivity unto freedom. Lehi is about to develop his thesis, expound on his statement that Joseph received great covenants from the Lord. This long verse spans millennia of earth history, touching down in three or four spots of time. Time 1: Somewhere around 1800 B.C. Joseph I is not a historically identifiable person, so estimates of his lifetime range from 2000 to 1600 B.C. Time 3: (possible) 34 A.D. The Messiah manifested. Time 4: 1830’s A.D. The Restoration. Lehi says that Joseph “obtained” a promise of the Lord. This verb implies more action on the part of the recipient than “received.” It is reminiscent of Abraham desiring righteousness (Abraham 1:2), or of Jacob wrestling with the angel (Genesis 32:22-32). Apparently faithful Joseph, who knew of God’s promises to Abraham, Isaac and Jacob, wanted to understand how those promises could be fulfilled when he was the one who had taken the chosen seed out of the Promised Land and into Egypt. God showed him that there was more than one “Promised Land.” Further, He showed him that the spiritual blessings of the covenant might be enjoyed in any land. Darkness may envelop any land, and light may be sought for and received in any land. I bless thee with the blessings of thy fathers Abraham, Isaac, and Jacob, and even the blessings of thy father Joseph, the son of Jacob. Behold, he looked after his posterity in the last days, when they should be scattered and driven by the Gentiles, and wept before the Lord: he sought diligently to know from whence the son should come who should bring forth the word of the Lord, by which they might be enlightened, and brought back to the true fold, and his eyes beheld thee, my son; his heart rejoiced and his soul was satisfied, and he said, As my blessings are to extend to the utmost bounds of the everlasting hills, as my father's blessing prevailed above the blessings of his progenitor, and as my branches are to run over the wall, and my seed are to inherit the choice land whereon the Zion of God shall stand in the last days, from among my seed, scattered with the Gentiles, shall a choice Seer arise whose bowels shall be as a fountain of truth, whose loins shall be girded with the girdle of righteousness, whose hands shall be lifted with acceptance before the God of Jacob to turn away his anger from his anointed, whose heart shall meditate great wisdom, whose intelligence shall circumscribe and comprehend the deep things of God, and whose mouth shall utter the law of the just; His feet shall stand upon the neck of his enemies, and he shall walk upon the ashes of those who seek his destruction: with wine and oil shall he be sustained, and he shall feed upon the heritage of Jacob his father: the just shall desire his society, and the upright in heart shall be his companions: No weapon formed against him shall prosper, and though the wicked mar him for a little season, he shall be like one rising up in the heat of wine - he shall roar in his strength, and the Lord shall put to flight his persecutors: he shall be blessed like the fruitful olive, and his memory shall be as sweet as the choice cluster of the first ripe grapes. Like a sheaf fully ripe, gathered into the garner, so shall he stand before the Lord, having produced a hundred fold. Thus spake my father Joseph. Therefore, my son, I know for a surety that those things will be fulfilled, and I confirm upon thee all these blessings. Joseph’s blessing was that “out of” his descendants this righteous branch would be raised up. It is not that Joseph’s whole posterity would be righteous. No one whose seed increases has that blessing. 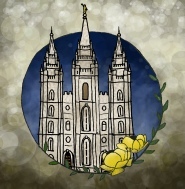 Lehi recognizes his own family as that broken-off branch, and he recognizes that he has the same blessing: “out of” his seed there will be a righteous strain. Lehi knows his place in history, and it is doubtless gratifying to know that his father Joseph also knew him and his family. It is even more gratifying to know that that branch – his family – who will not continue forever to be righteous, will be “remembered” by the Lord (and were observed with fatherly concern by Joseph) in the latter days. If we only read that Messiah would be manifest to them, we might think this refers to His visit to these people just after His resurrection. But the accompanying details point more to the Restoration period. It will happen in the latter days, and it will bring them out of hidden darkness and out of captivity. The Restoration blessed many lives, including Gentile and children of Ephraim. But Lehi’s chief concern is his own family. While children of Lehi do not make up a large part of the Church, and few of the children of Lehi have accepted the fulness of the Restored Gospel, this verse describes individuals. Joseph is an individual, Lehi is an individual, and every one of their descendants can come, one by one, to the light, and to freedom. who shall be a choice seer unto the fruit of my loins. Moses will make a similar prophecy. “The LORD thy God will raise up unto thee a Prophet from the midst of thee, of thy brethren, like unto me; unto him ye shall hearken. .” (Deuteronomy 18:15) and “I will raise them up a Prophet from among their brethren, like unto thee, and will put my words in his mouth; and he shall speak unto them all that I shall command him. And it shall come to pass, that whosoever will not hearken unto my words which he shall speak in my name, I will require it of him.” (Deuteronomy 18:18,19) Christians see this fulfilled in the Messiah, though its contextual meaning is that God will speak to His people through prophets, and they need not seek knowledge from enchanters and wizards. Christ was a choice seer to the seed of Joseph, and to the whole earth. and he shall be esteemed highly among the fruit of thy loins. which I have made with thy fathers. This verse clarifies any suspicion we may have had that the see Joseph spoke of and the Prophet Moses spoke of were the same. Moses made the statement, then a few verses later repeated the basic promise, and expounded on it with more details. Likewise, Lehi quoted Joseph’s basic statement. He now continues to quote Joseph’s expansion of the idea. The Prophet who Moses spoke of would be from “among his brethren.” Moses was of the tribe of Levi, but the Messiah was of the tribe of Judah, as were some other prophets. Old Testament prophets came from Levi, Ephraim, Issachar, and Benjamin. Moses’s brethren were of the house of Israel, not tribe-specific. Lehi took the original source material from Joseph and organized it in such a way as to generate links between the ideas he is presenting, with more depth than a simple linear reading. Verse 5 is a paraphrase of Joseph’s words, verse 6 is a quote from Joseph, and verse 7 is a direct quote from God speaking to Joseph. 1.Wherefore, Joseph truly saw our day. 5.that the Messiah should be made manifest unto them in the latter days, in the spirit of power, unto the bringing of them out of darkness unto light -- yea, out of hidden darkness and out of captivity unto freedom. 3.who shall be a choice seer unto the fruit of my loins. 3. and he shall be esteemed highly among the fruit of thy loins. 4.even to the bringing of them to the knowledge of the covenants which I have made with thy fathers. 1. Lehi calls our attention to his arrangement by his repeated use of “Joseph truly” – saw, testified, said. 2. Lehi identifies his own seed who will be raised up with the seer who will be raised up. We recognize that the Prophet’s major work initiating the Restoration was his translation of Lehi’s people’s book – the Book of Mormon. 3. The broken-off branch which is not the Messiah corresponds with Joseph’s seed who esteem that seer. Just as the branch is not recognized as being a part of Israel, the seer is not recognized by the world as being sent by God. 4. Lehi’s seed will be included in God’s covenants which are restored by that choice seer. 5. The great work of that seer would be to manifest Christ to those who want to know the rest of His story, to bring light to those who wish to see, to bring freedom to those who will act, and all of this done in the spirit of God’s power.